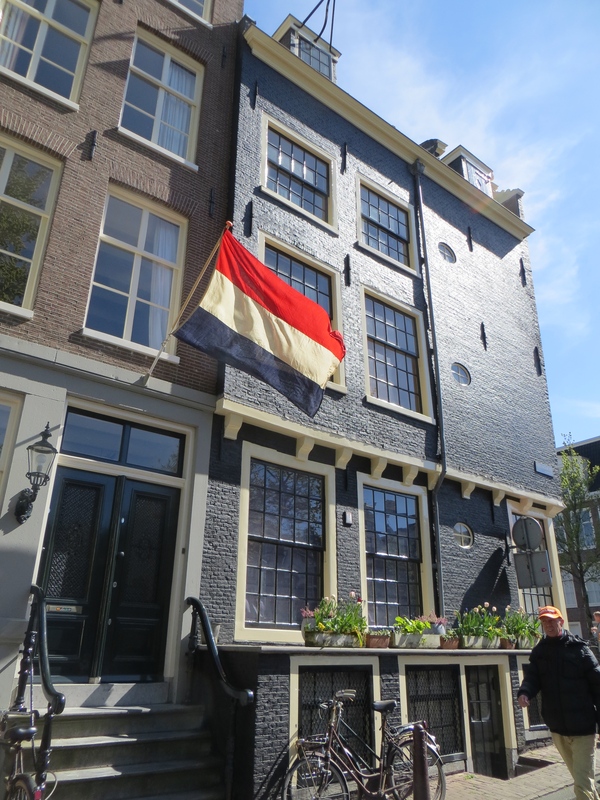 When we began researching a trip to Amsterdam, we came across several articles claiming that the best time to visit the city is April 27th–when The Netherlands celebrates their national holiday Konigsdag or King’s Day. Celebrated since 1890, the holiday is in honor of current King Willem-Alexander, who took the throne in 2013. 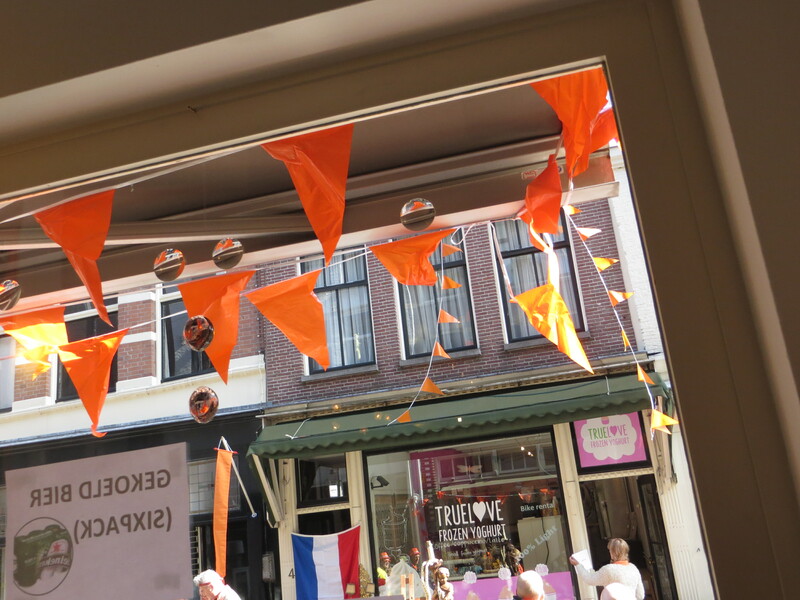 Before that, the holiday was known as Queen’s Day, in honor of Queen Beatrix who reigned from 1980 to 2013. I’ve celebrated the Fourth of July in several U.S. cities (including Washington D.C.) and nothing tops the feeling of being American on that holiday. 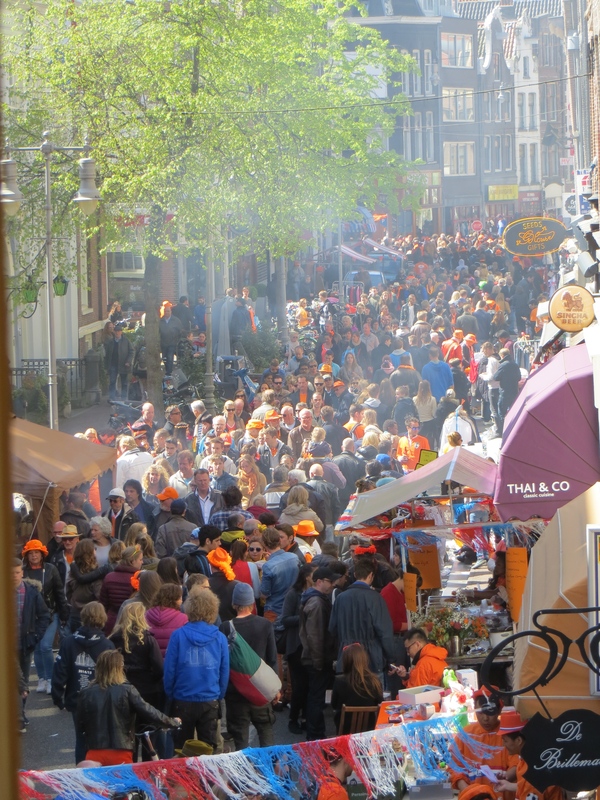 But as far as an all-day street party, I think the Dutch may have us beat with Konigsdag. 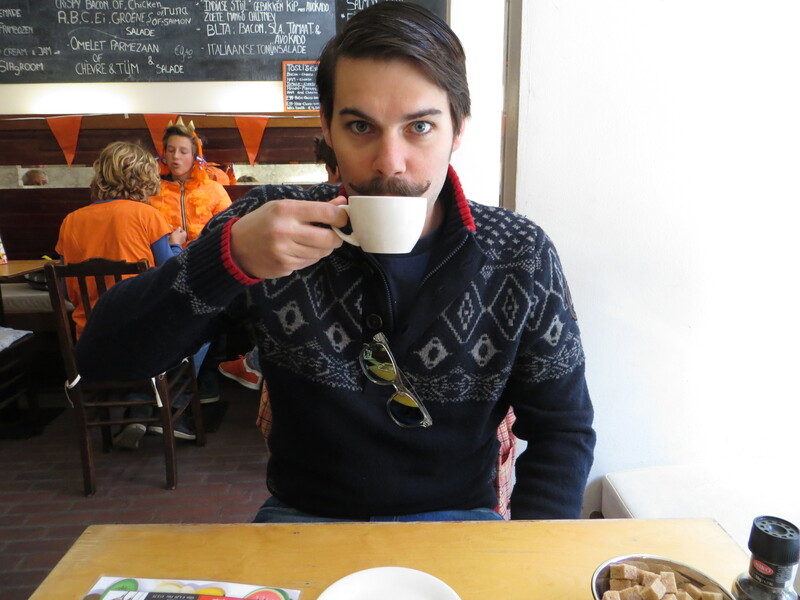 We got up early on Konigsdag to get caffeinated and peruse the much talked about street sales. In preparation for the holiday, people spring clean their homes and sell the things they no longer want on the street. We saw cooking equipment, shoes, sporting goods and everything in between. Even the smallest children go through their possessions and sell toys they no longer play with. Many children also sell baked goods and/or play musical instruments for donations. 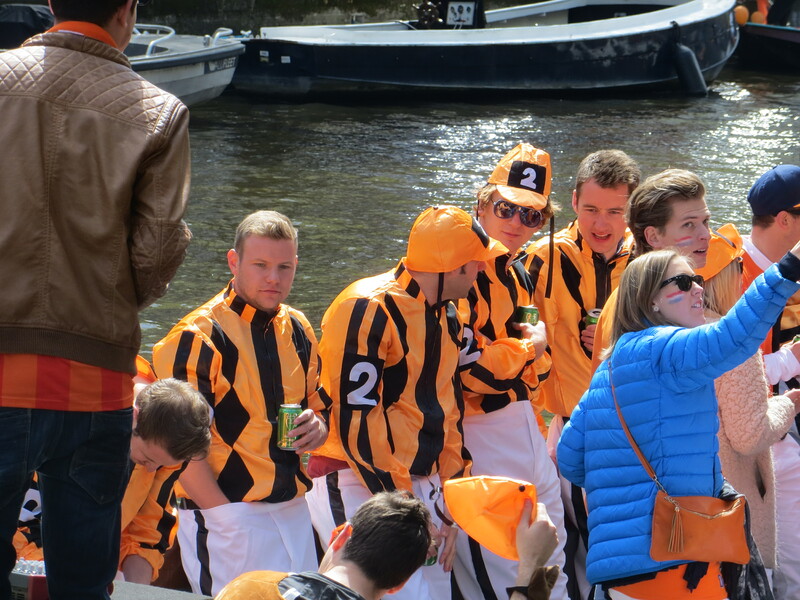 If you haven’t guessed it yet, orange is the color of Konigsdag in Amsterdam. Everyone dons some piece of orange–from hats to shoelaces–but wacky costumes are especially encouraged. As I packed for Amsterdam I realized I didn’t have a speck of orange in my closet, so my husband and I scurried over to Geneva’s Salvation Army and bought the only two orange items for sale: a pair of sunglasses and a plaid jacket. Even though they were a bargain, I wasn’t sure if we were wasting our Swiss francs…that is until we got to Amsterdam. The more orange, the better! 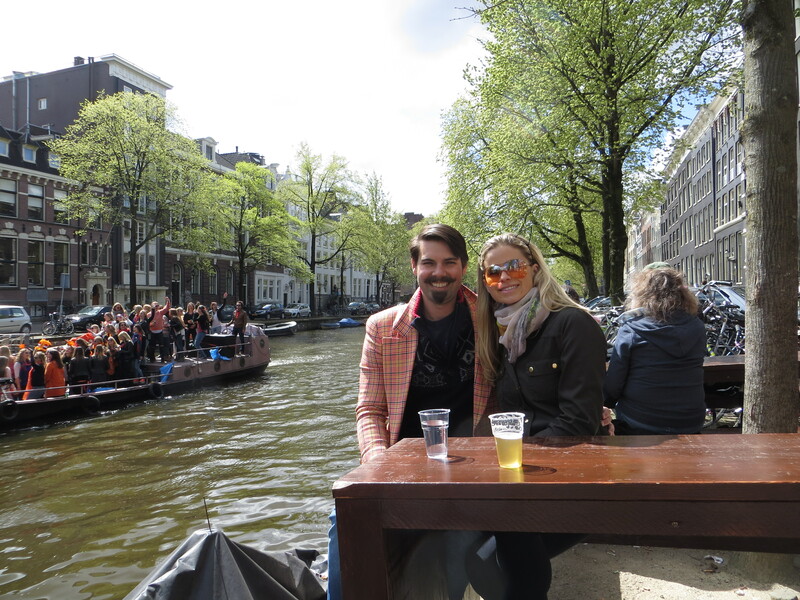 Since most shops and museums are closed on Konigsdag, everyone hangs out along the canals and just generally has a good time. We posted up at a canal side pub to people watch, or um, canal boat watch. 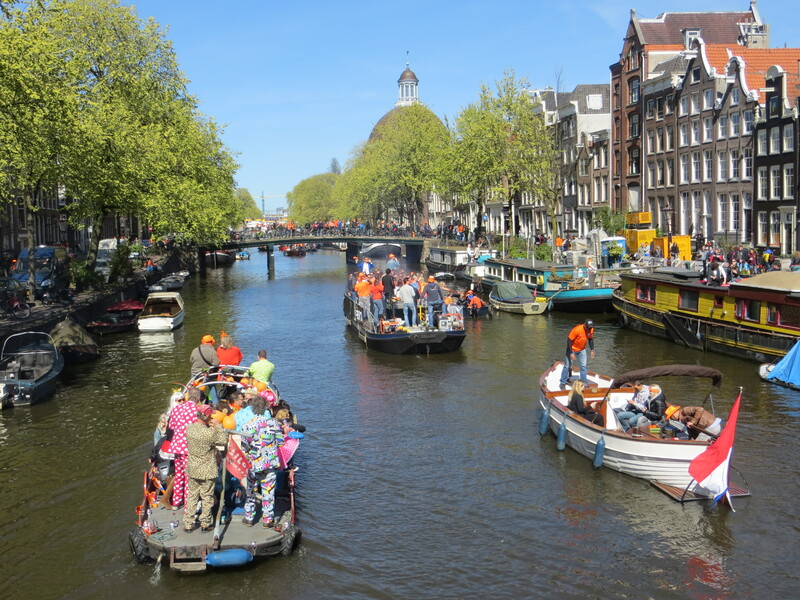 As the minutes passed from noon to 2pm, the canal became fuller with boats and the boats became fuller with passengers. Every other boat had a loud sound system, so it was a bit like a DJ was spinning different hits as the boats floated by. Along the bridges and the canals, everyone was dancing and toasting each other. 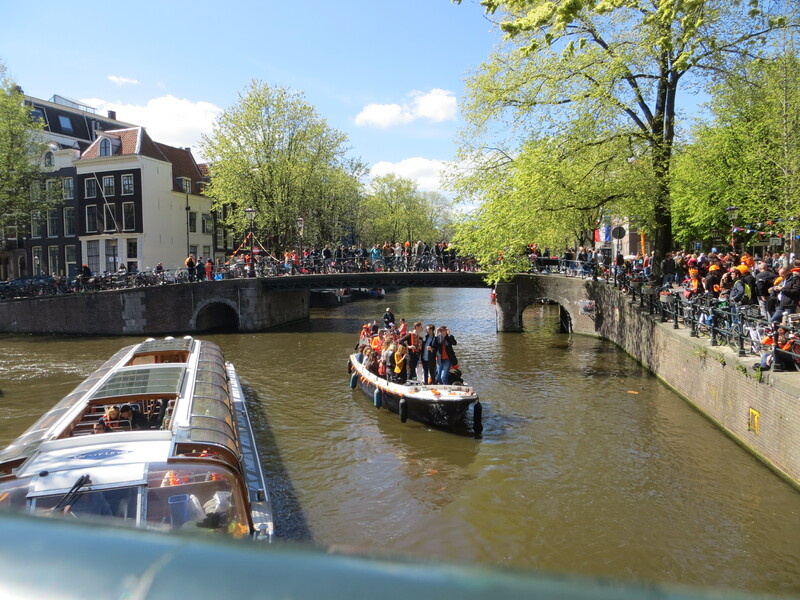 Some boats stirred up the bridge partiers by throwing orange confetti or by spraying them with water guns. 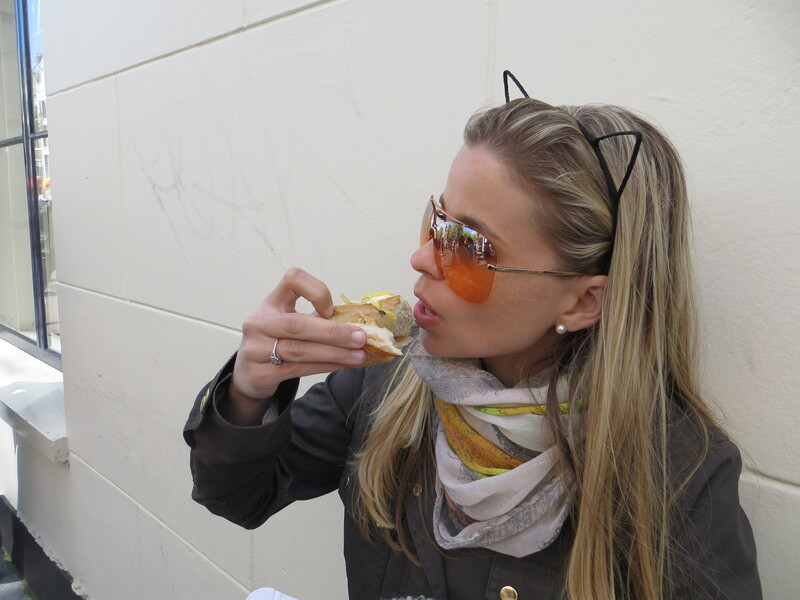 We made friends with the locals and by my second Hefeweizen, I was feeling really Dutch! The street food is another great part of Konigsdag. We tried local bratwursts (pictured above), Indonesian cuisine and stroopwafels–a thin waffle cookie sandwiched with caramel and dipped in chocolate. Delicious, but so sugary we couldn’t finish one split between us! Maybe it was my husband’s facial hair? As the sun set, the boats thinned out and only the rowdiest partiers kept going. 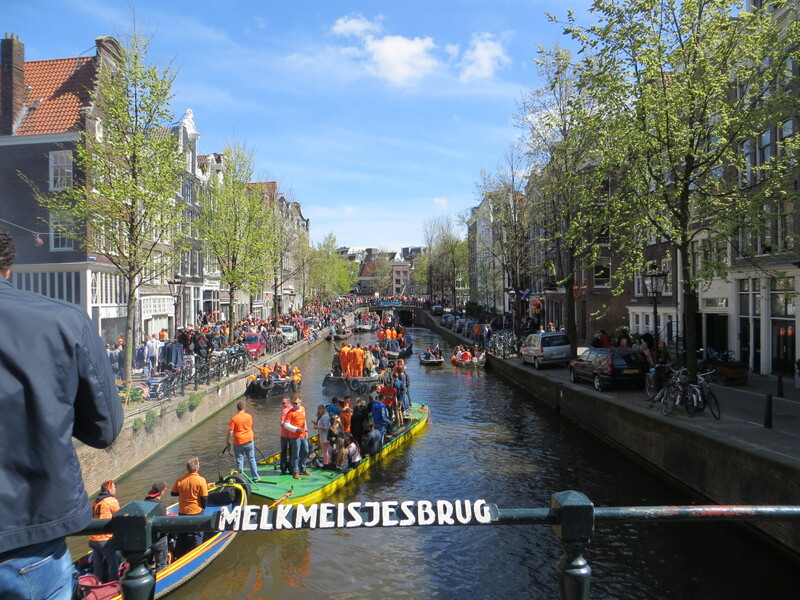 Since Konigsdag had been going in full force for nearly 10 hours, most locals returned home for family dinners. We were lucky enough to find a little Asian restaurant open around the corner from us– a true respite from the craziness. 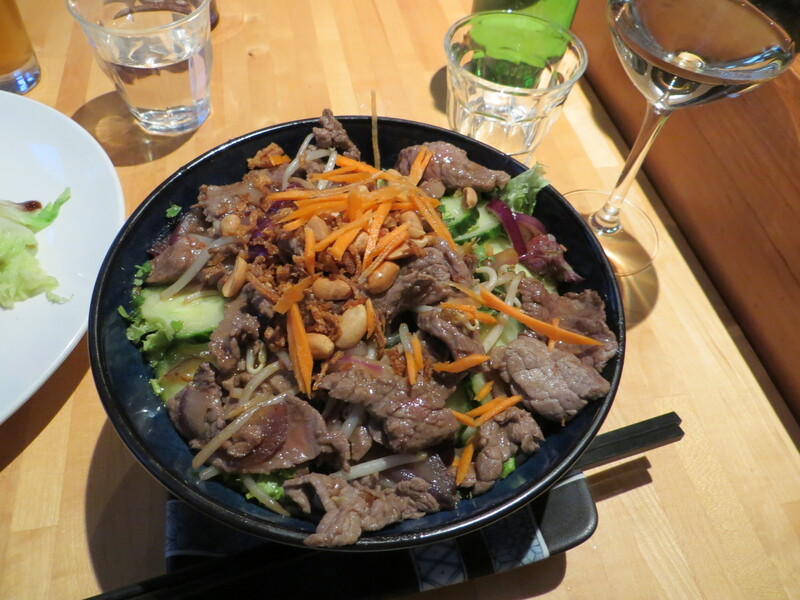 I topped the trip off with a heavenly grilled beef Vietnamese salad.